Medical Alerts - Astro Security Inc.
Help at the touch of a button is the safety net provided by Freedom Alert. This tiny pendant can be carried on a lanyard, wrist strap or belt clip. Simple to set up and easy to use, Freedom Alert keeps you in immediate touch with up to four contacts and can default to a 911 operator if those contacts are not available. 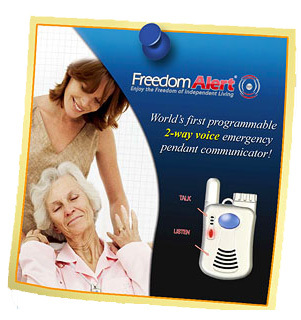 Freedom Alert is the first two-way voice emergency pendant communicator and, once you purchase it, it requires no contract or monthly fees. The Freedom Alert is simply safety in a tiny device that gives you the assurance of help no matter what the circumstances or where you are. This is a two-way communicator that actually lets you talk to the family contacts you have programmed, or to a 911 operator. It is not just an alert. With a rechargeable battery and emergency battery backup, Freedom Alert is always on the job. This important breakthrough is recommended by healthcare providers, doctors, and security experts through the country. With a simple setup, the base station plugs into the phone jacket. Splash resistant, so you can take it into the shower. Top notch company. Equipment is easy to use and techs do a fabulous job of installing and explaining products. ASTRO has some of the best workers, super friendly and informative. They know their product very well. They also take the time to make sure you learn your system and have a lot of patience when you accidentally set it off. This is a company that gives you that sense of security wether you're home or away from home. I would recommend them to all my friends. Copyright © 2019 Astro Security Inc. All Rights Reserved.